While it is going to take me a while to piece the evening together, I’m willing to call A Strange Dinner Party a success. The conversation flowed. Food and drink were consumed. Connections were discovered and forged. The highlight may have been after dessert when everyone pitched in to change a lightbulb–a task I don’t do when alone because it requires standing literally on top of the sticker on the ladder that says “Do Not Stand at or above this level. The Sazeracs and stimulating conversation left me so amped up that I managed to plow through nearly all of the dishes before collapsing into bed. I woke up inexplicably early, having slept a sum total of 10 hours over the past two nights. Sleep deprivation and weekend cocktailing had me feeling a little worse for the wear. I needed a hearty breakfast to fortify me for this afternoon’s New York Abortion Access Fund Bowl-a-Thon. My bleary eyes scanned the kitchen and alit on the now stale bread that my guests had apparently refrained from using to soak up their gumbo. Pour yourself a big glass of water and set the oven to 350. 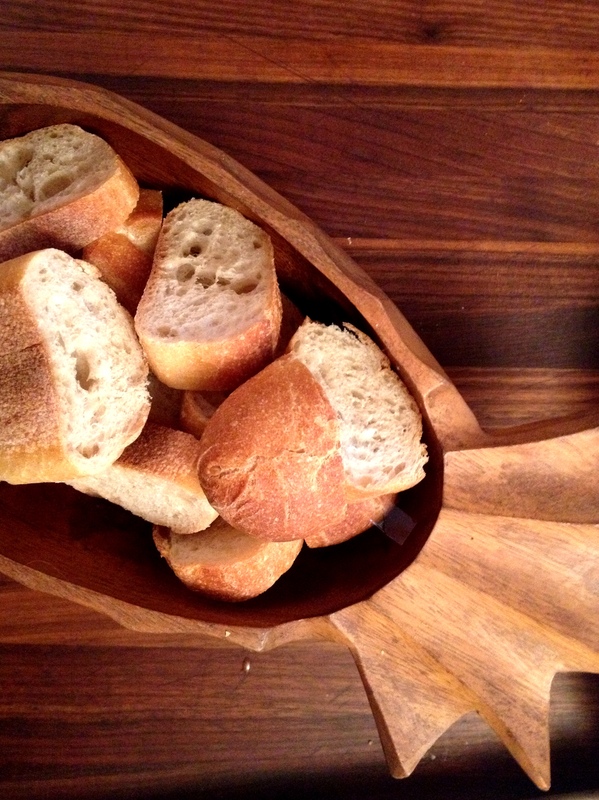 Grab those stale baguette slices and roughly cut them into 1″ chunks. Spread them on a baking sheet and pop them in the oven to toast until just turning golden. If you’ve got some leftover cooked veggies on hand, you’re almost home free. If, on the other hand, you polished off the last of the asparagus while doing the dishes last night, heat a cast iron skillet up to medium-low with a little olive oil. Add some sliced garlic (or onions or whatever) and a nice pinch of red pepper flakes. When the garlic starts to turn golden, add a big pile of broccoli rabe (or mushrooms or spinach or whatever vegetable(s) you have on hand). Season with salt and pepper and sauté until cooked through. If you happen to have a bunch of scallions you forgot to serve with last night’s gumbo, throw these in toward the end. Crack four eggs into a medium mixing bowl. Add a cup or so of milk or cream, salt, pepper and a pinch of two of nutmeg. Now stir in that cheese that you hastily packed up at the end of the night. This is a particularly nice way to recycle your already recycled fromage fort. Mix your toasted bread cubes in with the sautéed veggies and scoop this into a small baking dish. Pour the egg mixture over the top and pop your bread pudding in the oven. Cook until the eggs are set and the bread on top is nicely toasted–about 25 minutes, which should be ample time to fix yourself a much-needed cup of coffee. 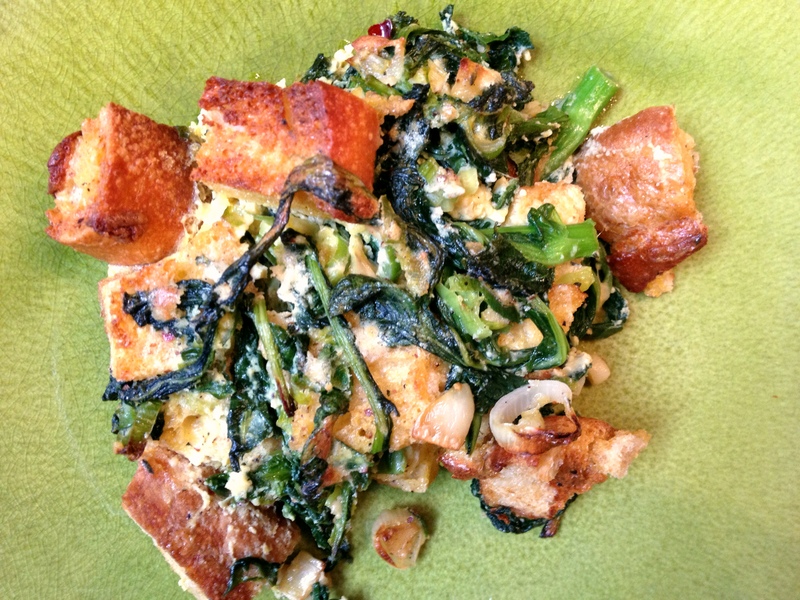 This entry was posted in breakfast, main courses, vegetarian and tagged bread, broccoli rabe, cheese, eggs, leftovers by Jasmine Nielsen. Bookmark the permalink.